^^ In that chart you can see how the exact same URL showcases two different Meta Descriptions depending on the keyword being searched. Everything is still beta, and we are only showcasing the data for the top 20/30 (about 90%), however we'll soon be expanding to the top 100 results. Classic Quick Glance is Back! We've made several coding improvements to make things smoother, like the ability to select the row limits you want to see at a time (should help users with less powerful computers or slower internet connections). You can also hide the legend. ^^ Even though the last time the "walmart.com" domain ranked for the keyword Pepsi was Nov 28th, 2016, you can hover over the date and see that we last checked that domain against the keyword a little over 8 hours ago. So "Walmart.com" last ranked for Pepsi at position #88 on Nov 28th, 2016 and then stopped ranking. You can hover over the keyword and see the exact URL that ranked still. Look out for more announcements in the coming days! It's the end of the year, and wow, what a year. 2016 will go down in history as THAT year. At SERPWoo we love saving as much as anyone else and around this time we like paying things in advanced for the next year to get some of these profits off the books, and we thought this year it was only right to extend that option to our users. Now within the subscription upgrade page you can switch to a yearly plan and get 1 free month of SERPWoo as an added incentive. We've had a ton of request in the last several weeks for yearly plans so it only made sense to enable this for everyone instead of doing it one-by-one. And yes the rumors are true: your bonuses will come with you when you upgrade or change plans! 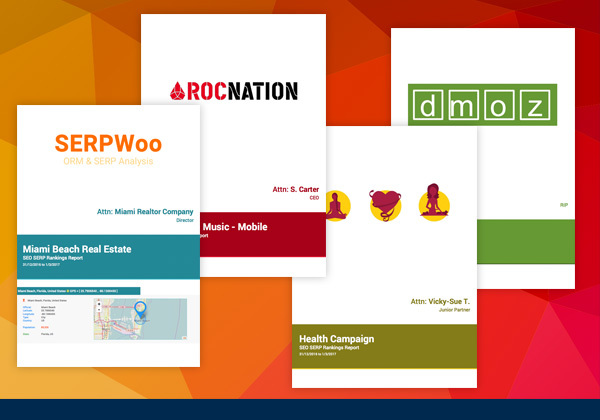 Click here to upgrade your plan and get 1 free month of SERPWoo with your yearly subscription. Partial URL recognition (Great for Google AMP and Youtube)! We're working on 3 more "long over due" major updates that we want to push out before 2016 is over, so stay tuned. The updates are going to be YUGE! Click Here to start playing around with the latest new features and let us know what you think! It's complete whitelabel for ALL accounts (even free). You can upload custom logos and update the color schemes to match your brand and/or client's brand. You can send the PDFs to up to 4 emails (during beta test - emails don't need confirmation). You can also use our ClientStats.com domain for the "FROM" email field for our whitelabeling option. You can customize the email sent and add a note within the PDF. You can schedule the emails for daily, weekly, bi-weekly, monthly or one-time. So to help us out and gain access to the Report Builder just message us within the In-App messaging system, and we'll shoot you over instructions on how to start creating PDFs. Once the beta tests are over we'll release the feature to everyone else. What we are really looking for is feedback on the experience, what parts don't you intuitively understand (so we can create instructional guides and videos for), and what you like and don't like about the outputted PDFs - as well as any other comments or suggestions (oh bugs as well, those are very important, even if you think something seems even just a bit off). Login and contact us within the In-App chat to start beta testing! I'm currently tracking roughly 120 keywords with another rank tracker for $20/month. I don't need 750 keywords, is there no cheaper Serpwoo plan? At the moment only the plans available on our pricing page are what's available. If you are simply looking for another rank tracker SERPWoo is probably not the best fit. Most users use it for deeper SERP research. We are mostly focused on completely visualizing the SERPs and uses for ORM monitoring so simple rank tracking might be overkill IMO if you aren't used to the experience.I apologize about the late response. Follow us on twitter @SERPWoo for the latest on what's going on. Google's at it again! Tons of changes in the SERPs today! SERPWoo Turns 3 Year Old - Cake Day!! Let us know what you think! We got more new updates on the way! Happy Birthday SERPWoo! We love you! Wanted to give a shoutout to @CCarter. 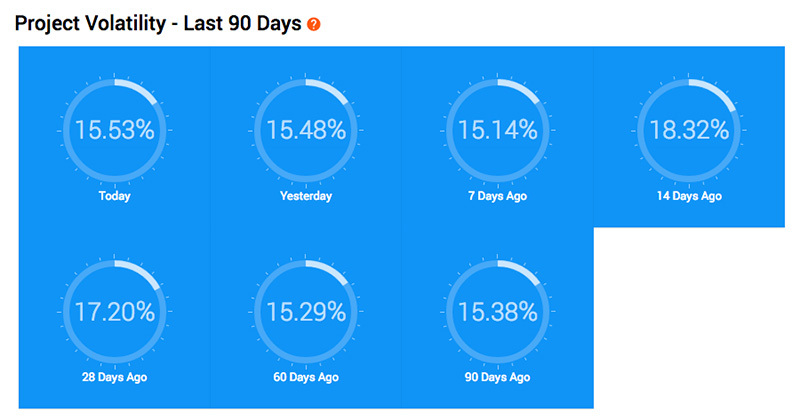 The recent improvement to load time for login (~3 days ago) with the SERPWoo interface is downright amazing! I think most people can't comprehend the volume of what's going on behind the scenes. Maybe a lot of people won't notice, if they have a small number of keyword datasets. I can tell you, if you have large datasets, like tracking tens of thousands of keywords....the platform loading in like 1 second is freakin RIDICULOUS! The exponential overhead involved with these sort of things is probably much of the reason you rarely (AKA = never) see other platforms handle more than maybe a few thousand keywords at most, as it just gets unmanageable with conventional and higher level programming methodologies. If it's any indicator of the technological prowess involved, I've had several friends that are experienced engineers from a couple Fortune 50 companies comment that what the Carter is doing is "insane". The proper respect due is Tha Carter. Big Google Core Update And New Feature - v1! Last Thursday Google sent out an update that shocked some serious websites - and once again SERPWoo is the first on scene (other trackers and monitoring tools always seem to be 1-2 days behind). As @Grindstone pointed out on twitter this is a scheduled core update - it was 2 days behind though. "We're two days overdue for a core update. Someone kick the hamsters over in Mountain View please." There are a ton of people that waste time SEO blogging and than there are people in the trenches like Grind. If you are looking to be on top of the latest Google Update before it makes headlines follow @GrindstoneSEO and grab yourself SERPWoo's latest v1 feature! Sometimes you have to go backwards in order to go forward. A little over a year ago we overhauled SERPWoo's entire interface and dubbed it v3 - the 3rd iteration. The consensus from members: "It is FAST!" And about 24 days ago, during the secret darkness of night, in an unannounced core update SERPWoo received a mega improvement to it's core code - the consensus from members testing: "This is even FASTER!" Now mega enterprise accounts and regular accounts can login in within seconds and get access to Gigabits of data in under 5 seconds. With this core update we'll be able to push out a series of new features we've been dying to get to you - the technology just wasn't there yet, until now. But first we have to take a step backwards - because we were missing a key component people kept begging us for. So for the last 2 months we've been in the digital mines grinding away to bring you more power and access to your data to do whatever you want with it! 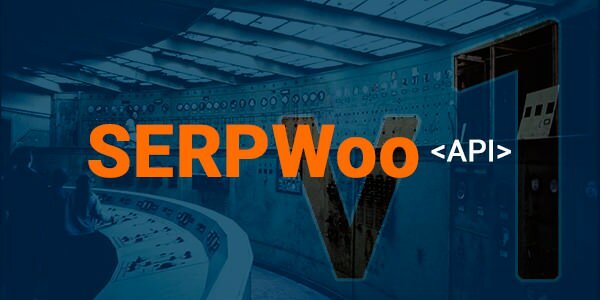 I would like to introduce to you v1 - the SERPWoo REST API! All data is outputted in JSON format for ease of use. At the moment there is no "API credits" situation - you get full access to your data - just stay within the Rate Limits. In the future we MAY instilling API Credits on data older than 90 days due to storage, but for now everything is available. The API is a RESTFUL API - so getting up and running should be a breeze. The beta testers love it so far with one stating "It is SERPWoo's "time to shine" indeed". Instructions to generate API Keys are there. If you are logged in and have generated an API key then you can reload the api.serpwoo.com page and your API key will populate within the respective fields for you. If you have any questions about anything just let us know! I can't even begin to tell you all how this changes up the game! As big brands and old money are quickly gobbling up tried and true digital marketing methods and turning them into a programmatic science, it is important to find more programmatic-oriented ways to make ourselves "combat effective" in our marketing efforts. One of those ways is auto/semi-automating analytics and data analysis so you can analyze quicker and pivot faster. Let me paint you a picture of the possibilities. Say you happen to be in a niche / industry where you've determined that search bot crawl rate volume and frequency appear to be closely tied to ranking stability. It might be wise to overlay and compare crawl rate with your rankings. Maybe important parts of your site aren't crawled frequently enough, which is really why their rankings suffer? Sure, you can do all this manually in excel, and maybe dumping your server logs. Who has time for that in 2017? Rankings declined for posts in this category. Crawls have been infrequent for posts in this category. Might want to improve internal linking within the category. Don't worry if you're not yet ready for that level of in depth programming either. Just get your API key with the instructions in the docs above. Then it's as simple as copy/pasting into your browser bar the appropriate URL for the report type you want (plus your API key in the URL). Save that to your hard drive and start experimenting with it. There are tons of open source dashboards and small programs out there already setup to read from JSON, so it's possible to get your copy/paste on for probably 70-90% of this, then just tweaking the code to read the appropriate keys and values from your JSON. Just start small and move fast. Did you know Jason Brown, Co-Founder of SERPWoo, is on the FBI's Most Wanted list? Winning - $200K Reward and ALL! ORM (Online Reputation Management) can be difficult for people with common names and even more challenging for people with unique names - Things happen, wrong time in the wrong spot with an android instead of an iPhone, or maybe the glove used to fit - I dunno. However What I do know is that ranking a single website in the search engine results is getting more difficult by the day, imagine having to rank 10 to 30 positive sites while moving down negative ones! But that's why you need to ORM like a Professional. Jason has put together 45 websites that are CURRENTLY ranking in the SERPs that you can utilize to help solidify positive results for your name, your brand, your client's names and brands, your spouse, your children's name, your dogs' name - not so much the cat, and much more. The key to this list is these sites are currently ranking NOW - so you'll see faster results than obscure ones. You can now see a running average of the SERPs of your keywords within each of your projects within the Insight Tab just like the v2015 version of SERPWoo. 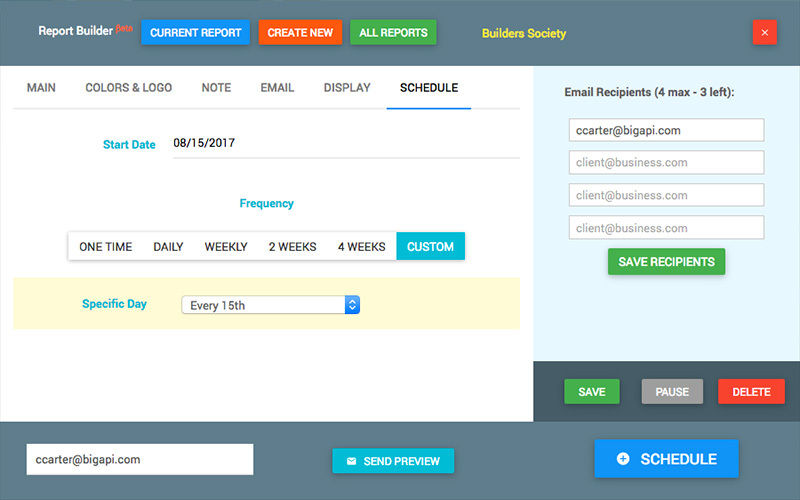 Customized Scheduling - if you want reports to go out on a specific day of the month like every 15th of the month that is now possible. Start Date - You can schedule when reports are suppose to start being sent to clients. 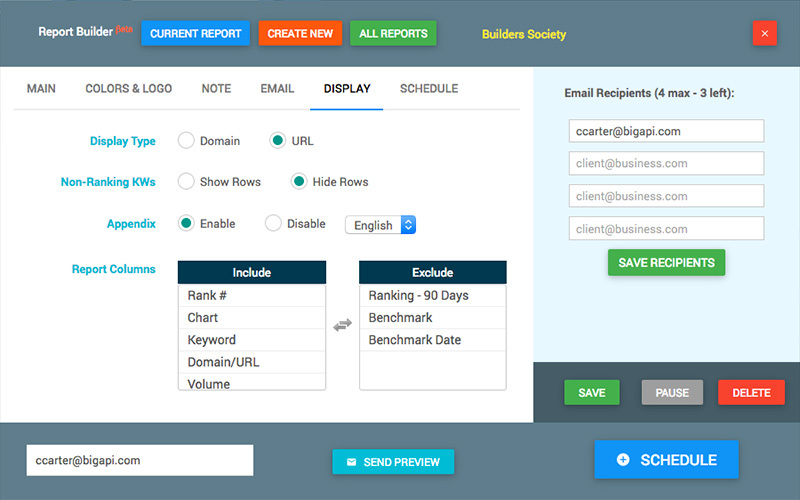 Customize Columns - You can now select or remove columns from the Keyword Ranking section of reports. Sparkline Charts - The sparkline charts in reports are now weighted. This week on our blog we have our first-ever expert roundup where we gathered experts and asked them some of the most important questions concerning SEO in the upcoming months. How Do You See Ranking In Google For 2018 Changing? What Can Marketers Do Now To Start Ranking For Christmas? What's The Hottest Ranking Technique Working Right Now? To say you will learn something new is an understatement. Even for myself, I was blown away by several answers and learned some new tricks with Google Maps. "Go look at some of the information behind Google's acquisition of the DeepMind company to see what might be in the pipeline... the potential is insane as to what Google's machines will be able to do in the future." "Large companies are gobbling up smaller sites, rolling them into their networks, and dominating SERPs." "With the rise of things like Google Home, Amazon Alexa and Siri users are starting to search the web differently, this means a different approach to SEO will be needed as we move forward." "Local Guides is basically google's new version of Mapmaker, where maps users can suggest improvements to google maps. The more successful changes you have made to google maps, the more authority you have." With only 83 days left until the start of the new year, focusing on a solid ranking strategy to dominate 2018 needs to happen now. Making those plans on January 1st will be too late! Find out everything we discussed on our blog so you can prepare before your competitors: Expert Roundup - SEO Heading Into 2018! @Ryuzaki, @Stephen and @turbin3 coming in hard. @CCarter should have PM'd Grindstone for those l33t tips though. Some great news first: We've been slowly alpha testing the newly coded Top 100 engine in the last 2 weeks and things are going smoothly so far for accounts in the test. This week we've started raming up the crawling and should have more and more data coming in throughout the week as things get back to normal! So a couple of people realized some of the hints we dropped in the last newsletter about the surprise we've discovered with the newest features. Today I wanted to drop the first in a series of blogposts about what we've discovered - and boy it is a doozy for people just starting out in SEO - insert sad_face. What I call Domain Age bullying is happening with 99% of the SERPs - it's gotten so bad that I spent one night last week up 12 hours just querying SERPs and looking at the domain age results, and it paints a bleak picture for anyone starting out with a new domain. But even after looking at the evidence we see no obstacle that cannot be overcome with a little ingenuity. So here is my challenge to you - let's make this fun. If you can find a keyword phrase within the keywords you are tracking that has 3 or more domains that are under a year old we'll give you a bonus code that increases your keyword capacity by 40%. And then login and hunt for those keyword terms that you think have 3 or more domains that are under a year old within the Top 20 results (it has to actually have a showcased age - some TLDs do not allow age to be queried so they do not qualify). Once you find a keyword term that qualifies for the Top 20 results having 3 or more domains that are under a year old send it to us within the In-App chat of the interface and we'll credit you with a bonus code that's a 40% increase in your keyword capacity. You only have to find one, Uno, single keyword result that has that. This should go without saying, but the bonus code can only be applied once per account and to prevent cheating we will only accept a keyword term once (no brand terms - I feel like I'm going to need a 32 page terms of services agreement for this) - so if another user has already reported that keyword term only they will be credited with it. If any funny business is detected you'll be disqualified - let's keep it fun. This bonus code challenge will end on November 15th 2017 23:59:59 EST. Anything after that will be disqualified. If you miss it, you missed it. P.S. Jason dropped his latest Podcast #10 - Ideas Or Execution? Which Is More Important - and it is a bit controversial cause I may not agree with some of what he says... But you tell us what you think. We've got some updates for you! The great news is the new Top 100 engine has been crushing it more and more everyday, so we should be back to normal operations with Report and Quick Glance soon with keywords under the Top 20/30 options. Some people asked why we have separate engines for querying - it's due to accuracy. We maintain separate databases so when we do comparisons on the positions for Top 20 against Top 100 - if anything is off in the top 20 positions for either when cross comparing we have a system that re-queries data, so it's always as accurate as possible. Other rank trackers only maintain one database and really do not have a way of double checking in case Google throws fluctuating results. Over the years we've refined our system so it's able to detect a Google split test and correct itself by re-querying data that's needed. In some cases you might see updated data throughout the day due to a correction - it's rare, but it happens. But we've started seeing patterns on the data and successful finds of keyword terms which meet the challenge and plan to following up with a blog post. So if anyone missed it, we are offering a Bonus Code worth a 40% keyword capacity increase. The challenge: If you can find a keyword phrase within the keywords you are tracking that has 3 or more domains that are under a year old we'll give you a bonus code that increases your keyword capacity by 40%. This bonus code challenge will end on November 15th 2017 23:59:59 EST (tomorrow midnight). Anything after that will be disqualified. If you miss it, you missed it. To help users interested in pulling the WHOIS, pagerank, and social signals for various domains and URLs we are tracking we've implemented 4 new commands which are already live. We'll be updating the API Docs (https://api.serpwoo.com/) shortly with these new commands. The querying is free - however if we find a string of abuse we'll curb the querying in order to maintain stability. Now you can do your own investigating against SERP results and pull data into your own systems. Jason also dropped his latest Podcast #10 - Ideas Or Execution? Which Is More Important and it is a bit controversial cause I may not agree with some of what he says... But you tell us what you think. @eliquid brought together a handful of experts again to help us understand what SEO campaigns really look like and how long they take, how to bust onto page 1 when stuck on page 2, and what kind of content the experts are using for various purposes. There are lots of experts from various areas of the industry, but this round also included a good group of BuSo users: @turbin3, @Ryuzaki, @Stephen, @stackcash, @jstover77, @propipper, & @NickEubanks. I know this is difficult to quantify, and is usually inaccurate/you have to put it through the gut test anyway... but when sorting through a large set of keywords to theme them down, this would be really useful to establish a baseline hierarchy. I searched around a bit but didn't find anything, just figured this exists with all the data they track, or I overlooked how to do it in the dashboard entirely. Thanks a ton if anyone has a tutorial link that covers this!! This week on our blog we have our second-ever expert roundup where we gathered up our experts and asked them some of the most pressing questions you had concerning SEO. How do you stay on track with a SEO project without giving up? How do you crack the first page if your site is on page 2? What kind of content are you using to rank with Google? This is a chance to learn from leading experts that have been practicing SEO for several years on a range of different verticals. Maybe you have a new site that is sitting on the 2nd page of Google and it has been months since you have seen any traction in getting it to budge forward. Could it be your content? Are you giving up hope? What more could you do to move to the first page of Google? First I would analyze the content of the top 10 rankings URL's including running tf*idf to build out a list of topics. I would then expand the topics into topic models by building out related keyword lists for each and organizing them into a content map for an optimized single target URL. I would look for patterns between the format/layout of the top ranked pages and then run link reports for each to get a sense of where I need to be from a total link profile standpoint at the specific target URL I want to rank. Then it's slinging emails until I get the links I need. 7 more experts weigh in on their thoughts as well and expand on even more tactics. With a little over a month left until the start of the new year, focusing on a solid ranking strategy to dominate 2018 needs to happen now. Don't be one of the many that try to start on January 1st.